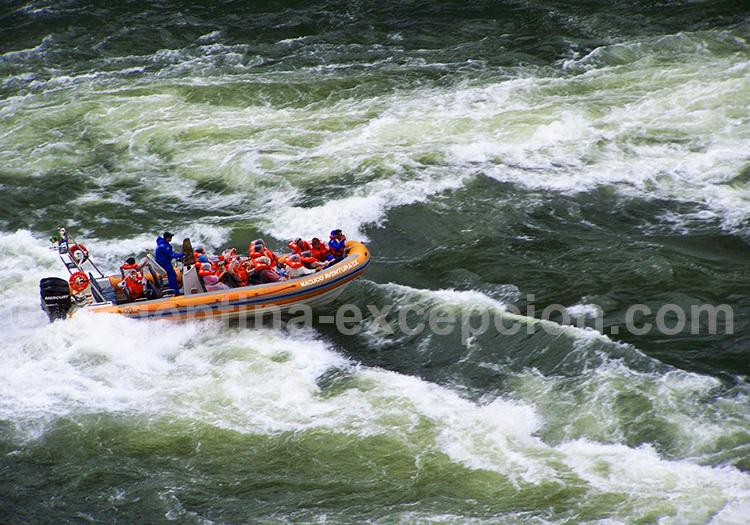 Informations on the iguazú falls and its région, between Argentina & Brasil. The Iguazú Falls are split between two countries, Argentina and Brazil and sit at the border of a third, Paraguay. The falls are protected by a National Park in each country. Iguazú National Park is located in the Northwest of the Argentine province of Misiones, in the Litoral region; 10.5 miles away from the city of Puerto Iguazú and 839 miles away from Buenos Aires. The 67,000- hectare park was created in 1934 to protect one of Argentina’s most beautiful natural sites, which is also one of the most visited ones. It was designated UNESCO World Heritage Site in 1984. The falls are located at the meeting point of the Río Iguazú and the Río Paraná. About 200,000 years ago, a geological fault in Paraná’s bed gave rise first to a sheer drop, the Garganta del Diablo, and then later to two large 8,858-foot arcs made up of 275 waterfalls. 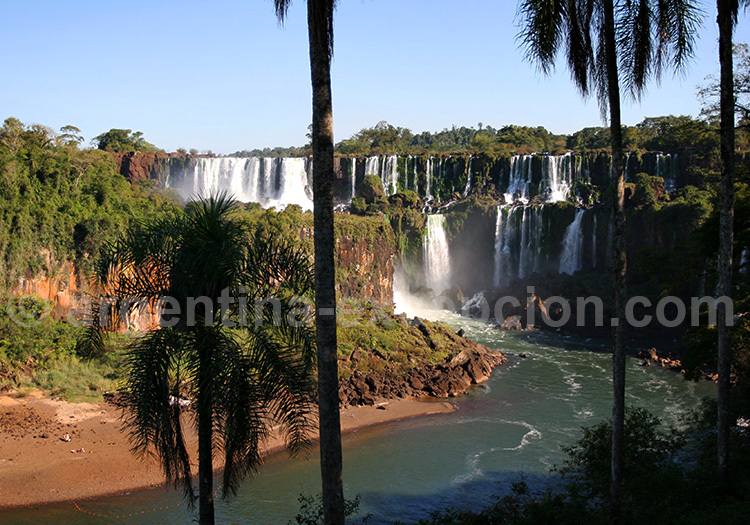 Most of the falls are located in the Argentinean side, where footbridges allow you to take a very close look. The Brazilian side offers a larger panorama. We recommend visiting both parks. The power of the falls depends on the rate of the flow, which generally comes to an average 1,800 cubic meters per second. The city of Foz do Iguaçu is the largest one, but Puerto Iguazú is quieter and more pleasant for travelers. As for the Paraguayan city of Ciudad del Este, it is a commercial city, one of the capitals counterfeit products. The climate is subtropical and very humid with an average temperature of 59°F in winter and 86°F during summer, which is the rainy season. We advise you to bring along a strong mosquito repellent and sunscreen. When the Spaniard Alvar Nuñez Cabeza de Vaca “discovered” the falls in 1542, he first named them Saltos de Santa María. They later got back their original Guarani name: “Y” for water and “Guasu” for big. The Guarani population had been living peacefully in the area since 1000, but at the beginning of the seventeenth century, the missionaries started converting the Amerindians in all three countries in the name of the Spanish king. 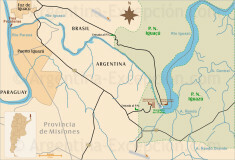 Their exclusive system, the reductions, added up to about thirty villages in the entire province of Misiones, as well as in the South of Brazil and in Paraguay. This episode has been brought to light by Franco-British director Roland Joffé in his movie, Mission, which featured spectacular scenes in the Iguazú Falls. Nonetheless, Jesuits and Guarani were expelled from the area at the end of the eighteenth century and the Missions were abandoned to the forest. A Guarani community survived and now sells its crafts in the park. A 1,968-foot path enters the forest leading to footbridges, where one can admire the falls from every angle. The lush vegetation, the sounds and smells of the jungle, the multicolored birds and butterflies give a taste of this extraordinary natural monument. The Upper circuit (2,132 feet) goes along the falls and leads to viewpoints and rest areas where one can take in the large panoramic view. The Lower circuit (5,577 feet) descends to the river via many staircases and passes lower and closer to more falls: San Martin, Bossetti, Dos Hermanas Falls… The path reaches a small pier where boats can take you under the falls. Excitement and showers are guaranteed! Another footbridge (0.62 miles) leads to the highlight of the show: la Garganta del Diablo. A breathtaking horse-shoe shaped gorge, which is 262-feet high and 492 feet wide, and falls into the river with a deafening roar. While walking, it is not unusual to see jacares/alligators, caimans from the forest of Misiones, sunbathing on the riverbanks. Sun and water vapor often create rainbows over the falls, crowning this beautiful landscape. Finally, from the visitor center, an ecological train serves the access points to the Upper and Lower circuits, as well as to the Garganta del Diablo. On full-moon nights guided tours are organized. Over 2,000 species of vegetation are listed in the park, as well as 450 species of birds including toucans, parrots, and vencejos, birds that only live in the park and vertically swoop down into the falls. Amongst the mammals, endangered species including jaguars and ocelots also live in the park. Less wild, the coatis come into contact with the visitors to steal food with their pointed muzzle that ends with a snout. The 185,000-hectare Parque Nacional do Iguaçu was created in 1939. The entrance is situated 10 miles away from the city of Foz do Iguaçu, in the State of Paraná. The Tancredo Neves bridge connects Puerto Iguazú with Foz do Iguaçu, 6 miles apart, but you will have to cross the border on foot because there is no ground transportation between the two parks. At the entrance to the park, buses drive visitors to the falls, located 6 miles away. The Cataratas path (3,937 feet) leads to the main viewpoint and a footbridge from where you can get closer to the Devil’s Throat than on the Argentinean side. The overall perspective on the falls is impressive. Half a day is enough to visit the Brazilian park, and you should count on a full day for the Argentinean side. Next to the park entrance, the Parque das Aves is a 5-hectare bird sanctuary protecting 800 species of birds, including macaws and parrots. Although Argentina has banned helicopter flights because they disturb wildlife, they are available at the entrance to the park on the Brazilian side. 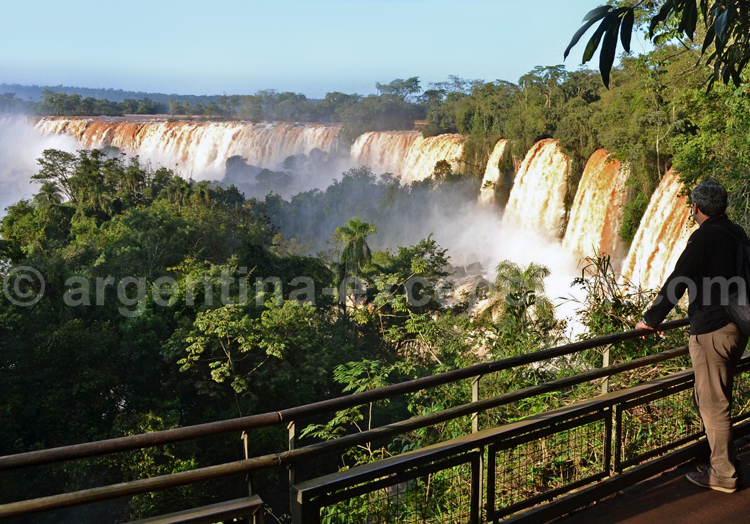 Hotels: where to stay in Puerto Iguazú and in misiones province? Panoramic Hotel Iguazú, Puerto Iguazú : Iguazú : one of the rare prestige hotels of the area with an outstanding view of the Iguazú and Paraná rivers. Swimming pool and gardens. 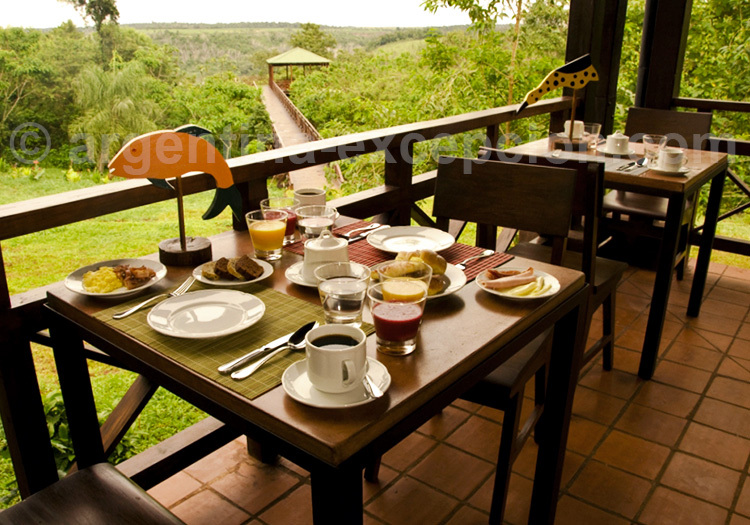 Hotel La Aldea de La Selva Lodge, Puerto Iguazú : built in the middle of the jungle, close to the falls. A must for an exotic experience. Estancia Santa Cecilia, Candelaria : 18 miles away from Posadas, on the road to Iguazú and the Jesuit missions, this estancia breeds livestock and exploits wood. Good atmosphere and activities ensured by the Gauchos. Hotel Posada Puerto Bemberg : in the middle of a 380 hectares park, this nice house of the beginning of XXth century is a small paradise close to Puerto Libertad, not far from Iguazú. 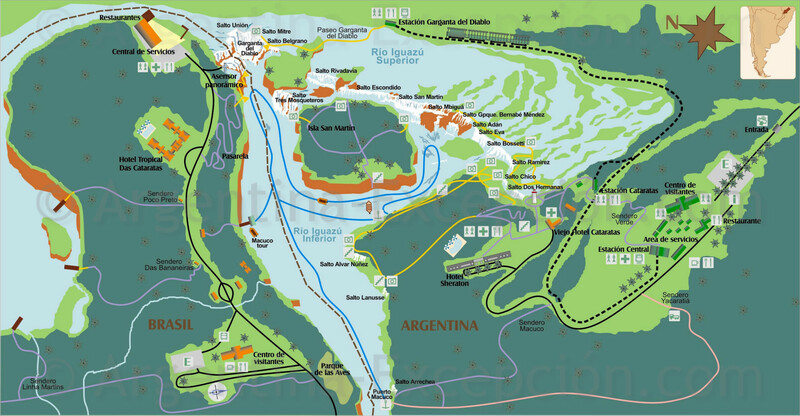 Transport: how to get to Puerto Iguazú ? Air : Aerolíneas Argentinas and Lan Argentina have several flights a day from Buenos Aires to Puerto Iguazú Airport (an hour-and–half flight). From Brazil, several companies fly to Foz do Iguaçu. Bus : the National Road 12 leads to Puerto Iguazú. On a bus, the trip from Buenos Aires is 17 hours long. Estimate a 6-hour ride from Puerto Iguazú to Posadas on a road which allows you to stop at the Jesuits missions. Moconá Falls : Located between Posadas and Puerto Iguazú, the Moconá Falls are a real natural curiosity: they are formed in the length of the river instead of in its width. It’s a magnificent 32-feet high water curtain, which spreads along 1.25 miles of the Uruguay River. The site is less impressive than the Iguazú Falls, but it is situated in the Yaboti Biosphere Reserve, a jungle where one can go on exciting excursions. Wanda Mines : 25 miles south of Iguazú, the Wanda Mines were only discovered in 1976, but they are now open to public. On the riverbanks of the Paraná River, semiprecious stones are extracted: quartz crystal, topaz, agate, amethyst and others…You may buy geodes and jewelry. 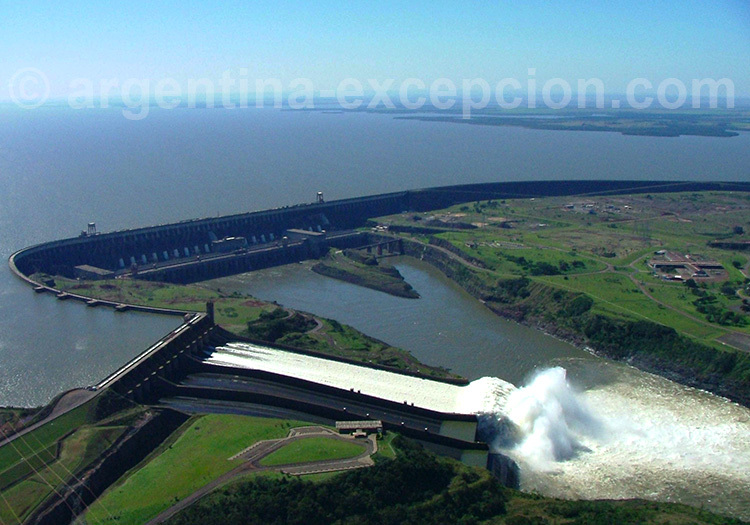 Itaipu Dam : This giant dam on the Paraná River provides almost all of Paraguay’s electricity and one fourth of Brazil’s. Its management is bi-national and the first generator started in 1984. The artificial lake contains 29 million cubic meters of water and has an installed capacity of 14 GW: it was the largest hydroelectric central in the world until the construction of The Three Gorges Dam in China. For those interested in large engineer works, visits are organized every day except Sunday. 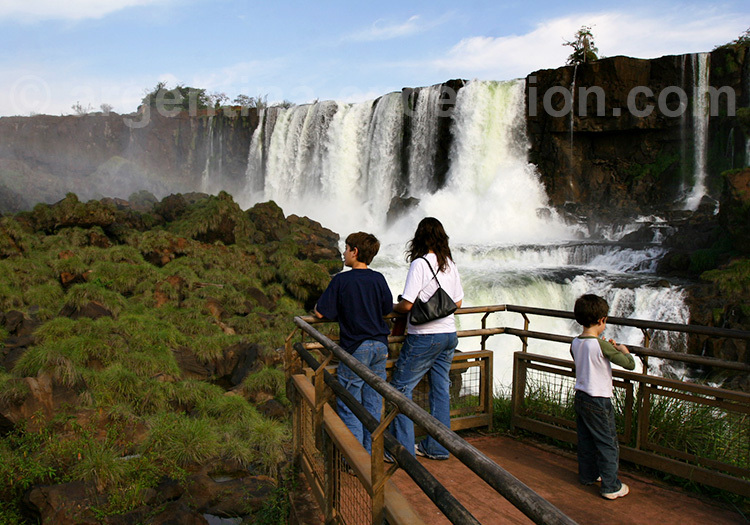 Yaboti Biosphere Reserve: Yaboti Biosphere Reserve is located in the mid-West of the province of Misiones and was named after the Río Yabotí, a river rich in falls and rapids. 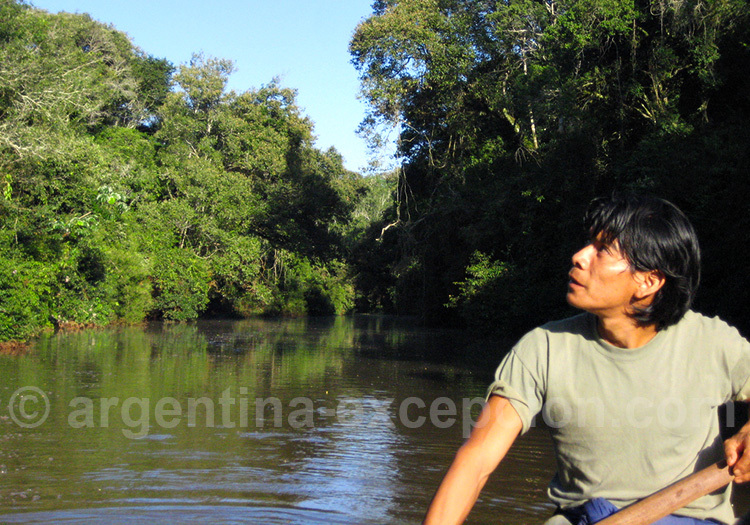 Nevertheless, the Amazonian-type forest, rich and dense, is threatened by the overexploitation of logging business. The forest provides a habitat for rare animals including the yaguareté (kind of jaguar), the puma and certain kinds of endangered toucans and parrots. Today, eight Guarani communities live in the Reserve, struggling to preserve their traditional lifestyle. The Jesuit Missions : Unesco declared the Jesuit missions a World Cultural Heritage Site and the ruins have been restored. The most beautiful ones are San Ignacio Mini’s. Today, one can still admire the magnificent gate of the Church, sculpted by Guarani craftsmen in red sandstone. The ruins of Santa Ana’s mission are partially covered by jungle. Loreto’s mission was the mission where the Jesuits installed the first printing-house of the country. 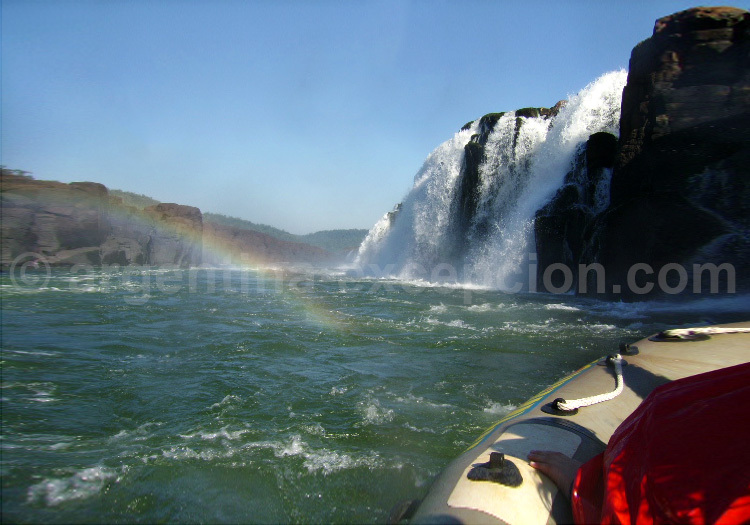 Excepción tour from the Northwest to Iguazu Falls : a 15-day trip with a driver-guide. Category of accommodation: exceptional. 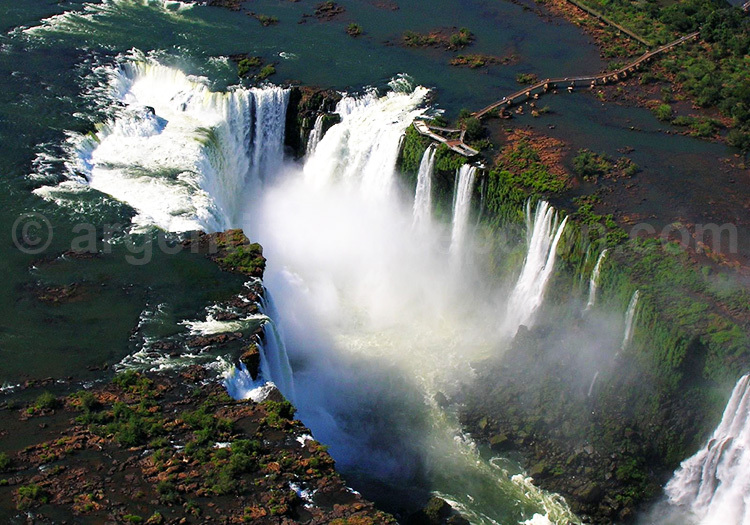 Travel Iguazu Falls, Esteros del Iberá and the Jesuit ruins : a complete 10-day tour in the Northeast of Argentine, fly and drive and charm hotels.